This series preview was published by THW St. Louis Blues correspondent Jeff Ponder and THW Los Angeles Kings correspondent Ramesh Shanmugam. The Blues were just the 2nd team to advance to the Semifinals, winning their matchup with the San Jose Sharks in 5 games. Earning a spot in the 3rd round will likely not come so easy. How they got here. The Blues stepped into the playoffs with a sour 1-2-2 record in their last five games of the regular season. They followed that up with a 3-2 double-overtime loss to the San Jose Sharks in Game 1 of their Western Quarterfinal Series. The series seemed to follow the lackluster end to the season, as the only goal that the Blues could muster early in Game 2 was when Sharks defenseman Marc-Edouard Vlasic inadvertently knocked the puck in his own net. But things changed in a hurry after Sharks forward T.J. Galiardi ran Blues veteran Andy McDonald midway through the 3rd period, cracking his helmet and causing McDonald to go on an absolute tear. McDonald went on to score 7 more points in the series (scoring an assist in Game 1 to lead both teams with 8 points), and the Blues never looked back. They scored 2 more goals in Game 2 and really put San Jose on the ropes early. Tying the series before it shifted to San Jose, the Blues took both games on the road then closed out the series at home in Game 5 with a 3-1 win. Brian Elliott was stellar as always, coming in relief for Jaroslav Halak in Game 2 after an undisclosed lower body injury kept him out of the rest of the series. Elliott went on to post a 1.37 GAA and a .949 save percentage, allowing just 5 goals against in 4 games. Top-6 playing like a top-6. The Blues’ biggest question mark down the stretch-run of the regular season was how the team would find ways to put pucks in the back of the net. The top 6 forwards for the Blues have shown up in the playoffs thus far, as one line did the scoring while the other one kept the Sharks’ top defensive pairing busy. 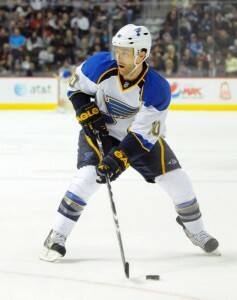 The McDonald – Berglund – Steen line contributed 9 of the 14 goals for the Blues in the post-season (one goal coming from point-man Jason Arnott on the power-play). San Jose wanted to keep the Oshie – Backes – Perron line in check since all three players were the top goal-scorers for the Blues during the regular season, so sending out Vlasic and Dan Boyle seemed like the logical choice. Head Coach Ken Hitchcock switched it up on the Sharks when needed. The centers on the top two lines were flipped multiple times in the series, so Hitchcock will have to keep the Kings guessing as to who jumps over the boards on the next shift. Power-play on a roll. The St. Louis Blues were notorious this season for having a not-so-frightening power-play. Posting an 18th-ranked power-play in the regular season (16.7%), the Blues were ranked 2nd in the first round, scoring 6 goals on 18 opportunities with the extra man (33.3%). The key for the Blues was strong movement around the perimeter of the offensive zone, generating shots from the point that Sharks goalie Antti Niemi had no chance of seeing. If St. Louis can find a way to put pucks past a strong Kings penalty kill (ranked 4th in the regular season with an 87.0%), they will be successful in this series. Easier said than done. Brian Elliott will have to be good but goal-scoring becomes more important. Elliott is the likely starter for the series with the Kings and there are few who would debate that. He is expected to come up as big as he has in the past, but the most important aspect of the game for St. Louis will be the offense. 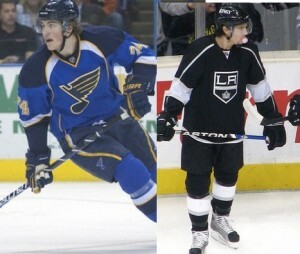 The Kings and Blues play a very similar style; one that does not call for a lot of goal-support. 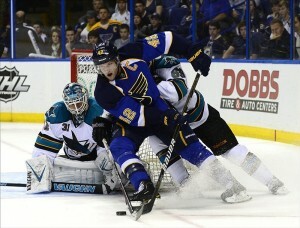 Still, the Blues cannot depend on winning every game 1-0. Kings goaltender Jonathan Quick was just as impressive as Elliott in the first round in his series against the Vancouver Canucks (1.59 GAA, .953 save percentage with 1 shutout). Andy McDonald emerged as the offensive star of the Blues’ matchup with the Sharks and he will be expected to lead the charge against the Kings. The Blues received strong offensive-zone play from top guns Backes, Oshie and Perron but they only generated two goals between them. They will have a tough assignment this series, likely going against top-defensive pairing of Drew Doughty and Rob Scuderi, but more offensive chances are needed if the Blues are going to advance to the third round. Throw away regular season matchup. Obviously, the regular season series strongly favored the Kings as the Blues took just three points in four games (1-2-1). This is the playoffs. Each team has 4-7 games to find each other’s weaknesses and attack them at every turn. The Blues are just as inexperienced as the Kings in the playoffs (Both teams have four former Stanley Cup winners on their respective roster). Anything can happen once the playoffs start; just ask the 8th-seeded Los Angeles Kings. The Kings produced the only upset in the Western Conference, defeating the top seeded and President’s Trophy winning Vancouver Canucks in 5 games. They now advance to the Western Conference Semifinals for the first time since 2001. First Round in Review. After losing the Pacific Division lead and the 3rd seed in the Western Conference during the last few days of the regular season, the Los Angeles Kings went into a first round matchup against the Vancouver Canucks filled with uncertainty. All of that uncertainty was quickly washed away by stellar goaltending and magnificent special teams performances in the first 2 games as the Kings roared out to a 2-0 series lead. Their power-play scored twice in the opening game of the series, while the penalty-kill was a perfect 5 for 5. In Game 2, the Kings added another power-play goal, went 5 for 5 again on the penalty kill, and then added 2 shorthanded goals by Dustin Brown for a 4-2 win. Jonathan Quick’s performance in Game 2 should also not be overlooked, as he stopped 46 of 48 shots to frustrate the Canucks. The theme of goaltending continued into Game 3, when Vancouver benched Roberto Luongo in favor of Cory Schneider. Schneider was good, allowing 1 goal, but Quick was perfect, stopping all 41 shots he faced for a 1-0 win. The Kings failed to close out the series on home ice as the return of Daniel Sedin powered the Canucks to a 3-1 win. 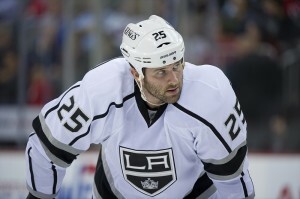 They would not fail twice though, winning a third game in Vancouver as Jarret Stoll finished the series off in overtime. Forget the Luongo Games. The Kings won their first 2 games against Vancouver with Roberto Luongo in net by a score of 4-2 each time. Luongo came into the series with a lot of pressure and the reputation of not necessarily being a playoff performer. Once Cory Schneider came in for Game 3, the Kings only managed 4 more goals in the last 3 games of the series, but still managed to earn the series win. Expect the series against the St. Louis Blues to be far more like the games against Schneider. Blues goalie Brian Elliott had very similar numbers to Schneider through the regular season and was actually slightly better (23 wins, 1.56 GAA, .940 Save %). Elliott is also playing in a much tighter defensive system, so the likelihood of the Kings scoring 4 goals in a game or chasing Elliott are very slim. Goal Scorers Must Wake Up. This has pretty much been the mantra of the Kings all season, and it continues to be the biggest issue they face in the playoffs. The Kings only scored 12 goals in the 5 game series against Vancouver, the least of any remaining team in the West. Five of those goals came through special teams (3 PP and 2 SH) in the first 2 games. Out of the remaining seven even-strength goals, 3 were scored by the top line of Brown-Kopitar-Williams, another 3 were scored by the 3rd line of Penner-Stoll-Lewis, and the last one was scored by 4th line winger Brad Richardson. While the Kings were fortunate to get such secondary scoring from their bottom two lines, the top two lines will need to produce more, especially at even-strength, for the Kings to advance another round. The most notable absentees on the scoresheet from the first round were Justin Williams and Jeff Carter, who ranked 3rd and 4th respectively on the roster in goals during the regular season. Carter was specifically brought in before the trade deadline to improve the league’s 2nd worst offense, so all eyes will be on him as tight, low-scoring games are expected in this series. Take Advantage of Emotion. One aspect of the Kings-Canucks series that worked to perfection for Los Angeles was the ability of the Kings’ forwards to get under the skin of the Canucks and force bad penalties. 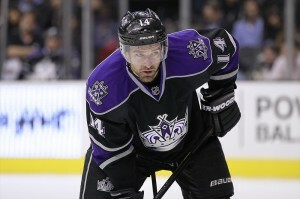 The Kings averaged 10.6 penalty minutes a game, while drawing Vancouver into taking 18.8 penalty minutes a game. This was led mostly by the forechecking efforts of the 3rd and 4th lines. Even though the Kings power-play often faltered later in the series, the ability to take 2 minutes off the clock with the lead can still be valuable in tight scoring games. The Blues come into this series after having a very chippy round with the Sharks. Their first round series led the league with 5 fighting majors for each team and bad blood developed quickly between the unnatural and newly formed rivals. The Kings would be keen to take advantage of a Blues team that already plays a tough and gritty style by pushing them over the edge while remaining in control of their own emotions. The playoff experience of former Flyers captain Mike Richards, who led his team to the Stanley Cup Finals in 2010, could prove to be very useful in playing an agitating, but smart style. Protect Jonathan Quick. Though goalie Jonathan Quick comes into this series with a strong first round under his belt (1.59 GAA, .953 Save %), his teammates did him no favors by allowing an average of 34.4 shots per game (3rd worst in the playoffs). The Blues are a very opportunistic team and will be all over the crease looking for screens, deflections, and second-chance rebounds. The Kings’ defensemen will need to do a better job of clearing out the crease area to give Quick a clean view of incoming shots and then clearing out any potential rebounds before St. Louis can pounce on them. Quick has been the team’s key to success all season. His stellar goaltending could drive his team and take them a very long way toward a berth in the Western Conference Finals.